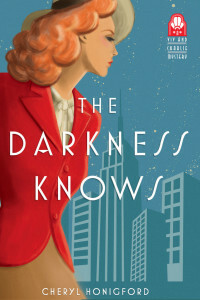 It only took me a few pages to realize that the title of Cheryl Honigford's debut mystery, THE DARKNESS KNOWS, is a play on the old-time radio drama called "The Shadow Knows." But I was too busy turning the pages to find out what would happen next to rising radio starlet Vivian Witchell to think more about that part! Scrappy, courageous, and determined to prove herself not just in the working world but also to her skeptical (and wealthy) mother, Vivian recently made the leap from secretary to dramatic reader of multiple parts, in multiple radio series. It's 1938 and far away from any feminist revolution -- Viv's the target already of another woman's greed for the drama parts, and unsure which of the men around her can be trusted not to take advantage of her. A killing at the start of the book puts this classic traditional mystery into high gear right away. Lucky for Viv, she makes the quick decision to hire a private detective to work for her and protect her from both the killer and in-house threats. "Were you here when it ... it happened? Did you see anything -- the person that could have done this?" Vivian glanced at the ashtray on his desk where the remnants of something still smoldered. That wasn't cigar smoke in the air. "I was working late, but I didn't notice anything unusual." He turned from the window briefly to glance at her, then turned back before adding, "Until I heard you scream, that is." Vivian felt the color drain from her face as the image of Marjorie's dead body popped into her mind. She didn't remember screaming. "Do you need anything?" she asked. ... "A drink?" When he didn't answer, she continued in a small voice, "I'll just go out and see if I can be of help to the police then, shall I?" Mr. Hart grunted. "Yes, go see what you can do." He turned to look at her and attempted a smile. Honigford salts her story with just the right amount of 1930s expressions and issues to make it enjoyable, while laying out a well-plotted "whodunnit" for contemporary readers to enjoy. It's clear this is the start of a series, and I look forward to more! Published by Sourcebooks, as an August release.